www.RFME.org | It's more than just a story about running a marathon.. It's more than just a story about running a marathon.. Please note that the explanation below was originally sent as an email to Dave McGilivray (race director of the Boston Marathon) first, and then forwarded to the BAA back in November 2018. To date, I have not received a response back from the people I sent it to at BAA. UPDATE: January 5, 2019. In December 2018, due to Julia’s failing health, they flew out to the Cleveland Clinic and she was placed on the lung transplant list. I have added this as Reason #6 (Julia and Her Family) but have kept the original letter intact to explain my story and reasons for requesting an entry for the 123rd (2019) Boston Marathon. My name is Roger Wright and I am seeking an Invitational Entry to run the 2019 Boston Marathon. Dave McGillivray knows my story, but I will provide a brief introduction, as well as why I need to run the 123rd Boston Marathon. When I was 7, my father ran Boston in 1968 and it had been a goal to run in his footsteps someday. In June 2008, I was 47, almost 300 pounds and hated running but dedicated myself to run the 2009 Boston Marathon. A big part of the reason I was running was to raise money for the Cystic Fibrosis Foundation, a disease that my then 9 year old niece Julia suffers from. In 10 months, I lost ~120 pounds, went from running 10 yards to running the entire Boston Marathon non-stop, with a pulled calf. To raise money for the CFF, I made a video that I called “My Journey To The Boston Marathon” which was reposted/renamed “The Most Inspiring Video You Will Ever Watch” by a friend. It went viral and currently has over 9,040,000 views. Below is a list that I have compiled to explain why I am asking for an Invitational Entry to run the 123rd Boston Marathon. Probably won’t seem it, but I tried to be brief. It will be my 10 year anniversary of my first marathon (2009 Boston). I am now 57 years old and I want to show others that you can change your life and maintain it, even after 10 years. If I put the weight back on, I fear others would use me as an excuse. I want to be an example for others to follow. My video now has over 9 million views. Take out the 2013 bombing videos and I believe it is the most viewed video on Youtube about the Boston Marathon. Many people find inspiration in it including Meb Keflezighi who told me it was one of his favorite videos. Still puts a huge smile on my face! My name is Chanyanut Nisaret. 38 years old. I just want to Thank you for your blogs and your story which made me believe that I can do it too. I started from 126.2 kg on August 12th, 2017 to walk at first until November 2017 I started to run on treadmills 10 minutes. And on June 2nd, 2018, I did my first marathon in my life in Stockholm marathon. And I had crossed the finish line of 4 marathons since June 2018. My next marathon is on November 4th, 2018 New York City marathon. I´m today 72.6 kg. Because of you, I had the courage to start my marathon journey and now I´m training to be a triathlete. It´s so amazing journey. It was really hard but I did it! Thank you so much for your inspirational story. It will be my 63rd full marathon in 10 years, most of them signed up for with people who have contacted me for my help. In each marathon, I have pushed myself as hard as I can, leaving nothing on the course. As far as follow-through, sadly, only about 20% make it to the starting line of any race, but it took me 40 years to finally control my weight and get to the starting line, so I know where they are coming from. I am not running Boston because it is The Boston Marathon. I was brought up here, my dad ran it when I was 7 years old and it has always been a part of my life. I live 2 miles from the course and run on it every week. Every year on Marathon Monday since 2009 except when I have run it officially (and 2011 when I ran London), I run 26 miles on the course, usually starting in Wellesley at midnight to the finish and back. I do this to pay homage to the race that literally changed my life. I am requesting an Invitational Entry as this 10 year anniversary race is extremely important to me, as well as to Julia and her family. I honestly believe that this “10 year” opportunity will allow me to help others as well as Julia and her family with possibly some additional media exposure. Thank you for your consideration and any help you could provide. Just as I did 5 years ago I will usually make a video to raise money for Cystic Fibrosis, a disease that my niece Julia suffers from. This is that video. When I initially started thinking about this video a few months ago (more like 6 months ago when I received my entry confirmation), I envisioned splitting the screen and have two videos playing simultaneously: my original 2009 Boston Marathon video (which ended up being reposted/renamed “The Most Inspiring Video You Will Ever Watch” and going viral) and the same shots, same clothes, etc 5 years later. I suppose I was inspired by those Now and Then pictures. Fortunately I quickly came to the realization that this years race is not just about me, but about the event of last years bombing and the effect it had on others. I went down to the Boston Marathon course and started shooting video of everyone training. And while I got some great footage, I just couldn’t get it to work. First, Just how important the Boston Marathon is to me and how it actually saved my life. Right after I ran Boston 2009, I made a promise to myself that I would run the marathon five years later for a couple of reasons. Primarily so that I would be forced to keep on running and keep the weight off. In addition, I wanted to show others that have come to know my story that I was able to keep the weight off for 5 years and hopefully inspire them to embark upon their own journey, if they haven’t started yet. In addition, I also wanted to show the viewers of my original video that I DID end up crossing the finishline of the 2009 Boston Marathon and that the story has continued to go on. This is the reason that I started out the video with the same footage as I did in the first video and I look at this video as kind of the conclusion of what happened after I left Hopkinton that day. In addition it also established that the only way you can cross the finishline in Boston is to start running in Hopkinton. And finally, selfishly, I love that Mary says “Love you” because without her support, none of my story would exist. Second, I wanted to show the camaraderie amongst all runners. I shot the footage of all the runners back in September when I ran Mainly Marathon‘s “Center Of the Nations Series” (aka CONS) of marathons. I thought it would be a nice idea to designate one of the 5 days as “Boston Strong” day where runners could show their support for Boston. I contacted the race director, Clint Burleson, with my proposal and he was 100% on board. I generally don’t like to reuse footage from one video but after struggling with fitting the footage that I shot on the marathon course, this footage popped into my head and it did a excellent job of accomplishing what I wanted to show: the camaraderie of the runners. There is also a sub- component of this video and this “camaraderie” idea as well. The Boston Marathon is a unique race in that it is a goal of most marathoners to someday run this iconic race, known throughout the world. This year, we are a unique group of 36,000 runners and each of us did everything we could to run the race this year. Each one of us has our own special reason for wanting to run it and all 36,000 of us will start running in the same place (Hopkinton) and stop running once we reach Boston. And that is why I chose the song “We Come Running”. 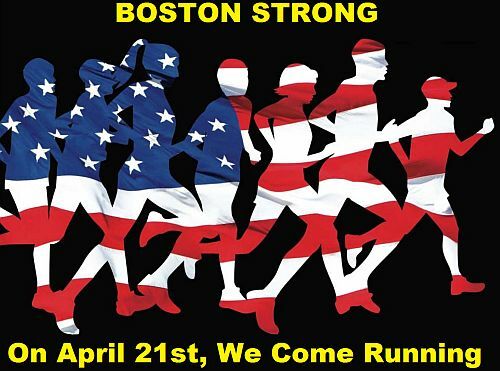 We will not run in fear of what happened in the past and we will run with “Boston Strong” pride in our hearts. Thirdly, I need to somehow make a solicitation for donations for Cystic Fibrosis. Of the three purposes, this was without question the hardest. Actually if you ask any runner who runs a marathon for charity which is harder to do, solicit donations from friends and family or run 26.2 miles, I have little doubt they would all say asking for donations. 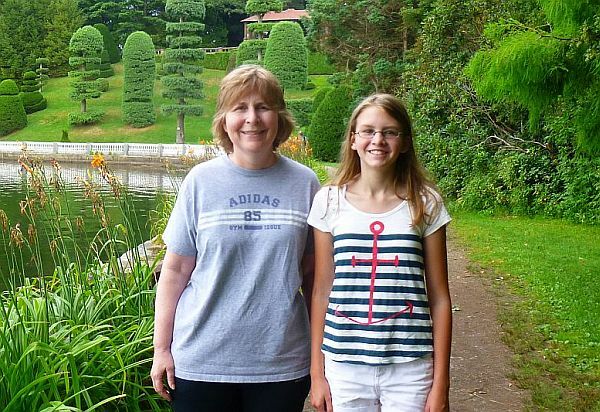 It shouldn’t be hard, especially looking at the picture below of my wife Mary and Julia (now 15! ), but it is. I really had no idea how to segue over to subject of donations until I had watched the footage of the runners for the 100th time and then it dawned on me. One of my earlier videos was a project where I got different people to say “Julia”. I have never stopped collecting these videos and every once in a while my friends will just say “Julia” out of the blue. Sally was one of the 5 people that I ran the 555 with and as she ran by the camera she shouted “Julia”. No one would get the reference outside of my friends so I really didn’t pay any attention to it…until the day I was looking for some way to bring in the donation request. Like a light bulb going off in my head, I saw the opportunity and with a little audio and video editing, was able to line Sally’s comment up. So if you would like to help out Julia and everyone else that suffers from CF, you can click on the link below and you will be whisked away to my 2014 Boston Marathon Firstgiving page. 100% of your donation goes to the Boomer Esiason Foundation which funds research as well as financial aid for the families that must deal with this disease on a daily basis. Well that is obviously WAY too much information about a simple video but I thought it would be a good way to start the blog on my new website off. Thanks for reading and watching and have a great day!